Used by the U.S. Navy, 303® Marine & Recreation Aerospace Protectant is designed to withstand the harshest of marine conditions. Which makes it the perfect protectant for sports gear. Whether you boat, fish, ski or all of the above, you’re bound to be astounded by the impact just one little bottle can have on your outdoor equipment. At least, that’s what our customers tell us. Everyone knows to bring along sunscreen, hats and sunglasses when spending a day on the water. But did you know your kayak needs sunscreen, too? No, not the same kind you wear. (It wouldn’t last long.) 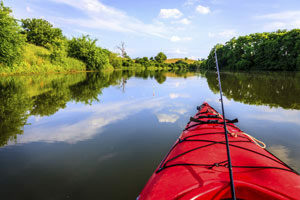 But a spray of specialty protectant will keep bright yellows yellow and cherry reds red—even if you take your kayak out day after day and week after week. Latex rubber is one of the most environmentally sensitive materials out there, and is very difficult to protect from ultraviolet damage. A spray of Aerospace will keep dry suits stretchy and strong for many seasons. 303® Marine & Recreation Aerospace Protectant slows down natural fading, makes repairs easier and prevents the vinyl from sticking together when deflated and in storage. Use it to easily hose off fish scales and blood, and to prevent ice from sticking to or building up on ice fishing rods, guides and lines. When sprayed on the tops of cross country skiis, Aerospace will prevent snow from piling up, even at high altitudes or in fresh snow. We’ve heard stories about making banshee riverboards faster, adding 30 feet per fly fishing cast with no additional effort, keeping sailcloth clean and even extending the life of paragliders. No matter what type of gear you use, applying Aerospace always requires the same simple steps: spray on, wipe off. Use a dry, never damp, cloth or towel to remove any excess and ensure your gear is completely dry. How do YOU use 303® Aerospace Protectant? Let us know on the 303 Facebook page!